On the 14th of March 2018, the Losonczy István Hagyományőrző és Sportegyesűlet Association organised the annual event of commemorating the heroes of the 1848 Hungarian Revolution. The event was held next to the village of Dudeștii Noi, in front of the monument that commemorates the 54 patriots who fought for freedom on the 9th of August 1849 close to the above mentioned village. The initiative of organising this event was taken by Losonczy István Hagyományőrző és Sportegyesűlet Association, and other civil organisations. Beside thecommemorative event, the participants took care actively of the aspect of the area surrounding the monument. 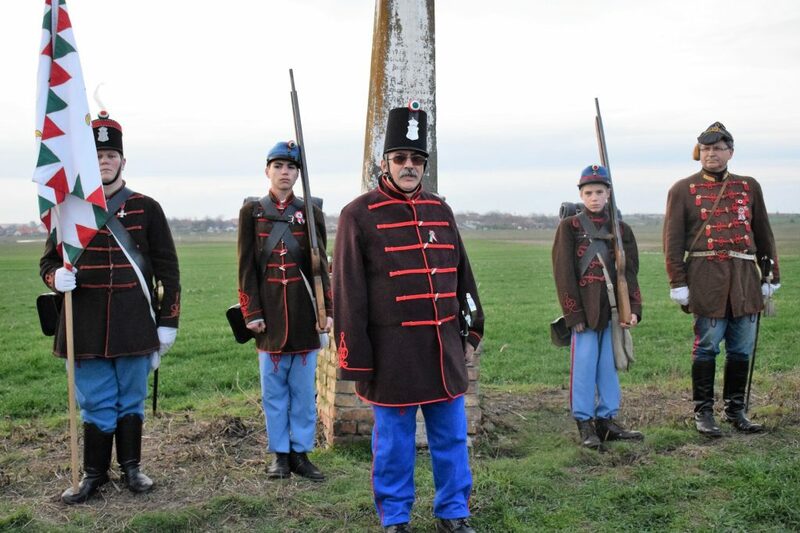 During this event, the guard of honour was represented by members of Szegedi III Honvédzászlóalj Hagyományőrző Egyesület Association (dr. Juhász János – captain, Farkas Attila – corporal, Ottokán Milán and Ottokán Radován – soldiers), and also by themembers of the Losonczy István Hagyományőrző és Sportegyesűlet Association. The musical performance of Mrs. Makkai Zsuzsanna Eszter opened the event, followed by the speeches of the actors Balazs Attila and Molnos Csaba, who brought back to life, based on the written sources, the history and memory of the fallen heroes. Erdei Lajos, the president of the Losonczy István Hagyományőrző és Sportegyesűlet Association, also spoke about the collaboration between the association and the local administration, in order to find a more suitable place in the future for the commemorative monument. The religious ceremony was held by Father Szilvágyi Zsolt, representing the Iosefin Roman-Catholic Parish and Gazda István, representing the Reformed Church from Timișoara. The message transmitted by the representative of the Reformed Church was one about maintaining the real traditional values and about the power of the eliberating feeling when the assuming of sacrifice is embraced. It was also emphasized the importance of our common values, and our responsability of passing these values to the next generation. This event was enriched by the participation of Pál Zoltán, Makkai Gergő Bottond, by the members of the Losonczy István Hagyományőrző és Sportegyesűlet Association, and also by the folk dance ensemble Butykos who danced and performed old hungarian songs. The flower wreaths layed in front of the monument belonged to Szegedi III Honvédzászlóalj Hagyományőrző Egyesület Association, Bartók Béla High School, Rákóczi Association, Erdélyi Magyar Nemzeti Tanács, Erdélyi Magyar Néppárt, Erdélyi Kárpát Egyesűlet, Meritum Association from Szeged, the Hungarian State Theater „Csiky Gergely”, as well as the members of the Losonczy István Hagyományőrző és Sportegyesűlet Association. Last, but not least, we have to emphasize the fact that at this event were present a lot of citizens who wanted to commemorate the fallen heroes.